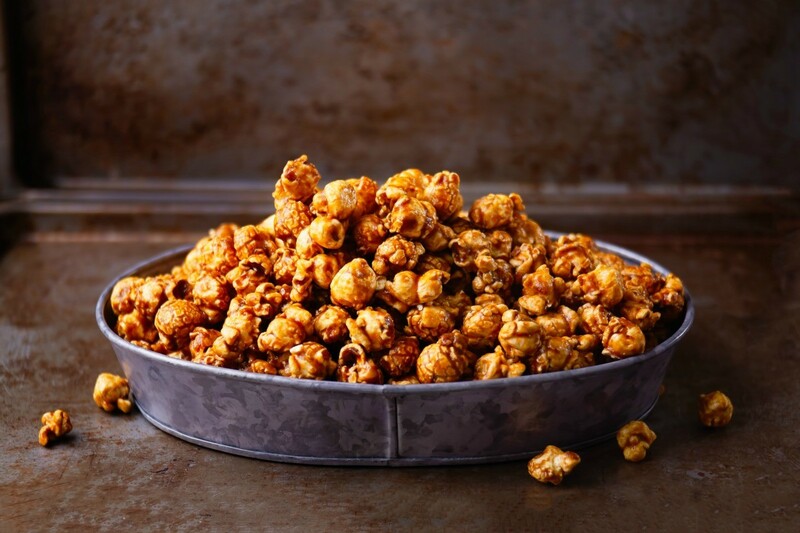 Once you have popped corn a delicious treat can be made by coating with caramel and baking it. 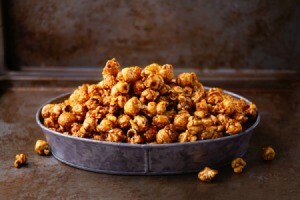 This is a guide about baked caramel popcorn. This homemade caramel corn is easy to make and is just as yummy as the store bought caramel corn. Preheat oven to 250 degrees F. Combine sugar, butter, and syrup. Boil 5 minutes. Remove from heat. Add vanilla and baking soda, blend well. Pour mixture over popped corn and mix well. Place popcorn on cookie sheets. Bake for 30-40 minutes. Let cool and then break apart. Store in air tight container. Caramel popcorn does not get hard, but turns into a powdery sugar after baking. Does anyone know what I did or what I can do to rectify the problem? Place the popped popcorn into a large brown paper bag. Set aside. In a 2 quart casserole dish, or other heat-proof glass dish, combine the brown sugar, margarine, corn syrup, salt and vanilla. Heat for 3 minutes in the microwave, then take out and stir until well blended. Return to the microwave, and cook for 1 1/2 minutes. Remove from microwave, and stir in the baking soda. Pour syrup over the popcorn in the bag. Roll down the top once or twice to close the bag, and shake to coat the corn. Place bag into the microwave, and cook for 1 minute and 10 seconds. Remove, shake, flip the bag over, and return it to the microwave. Cook for another 1 minute and 10 seconds. Dump the popcorn out onto waxed paper, and let cool until coating is set. Store in an airtight container. But the last two times the caramel turned into a powdery sugar after baking. Does anyone know what I did or what I can do to rectify the problem? Pop both bags of microwave popcorn, and empty them into a large roasting pan, or two 9x13 inch pans. Remove as many unpopped kernels as you can. Turn the oven to 250 degrees F, and place the popcorn in the oven to keep warm. Place the butter and sugar in a medium saucepan over medium heat. Stir until the sugar melts, and continue to cook, stirring, until the butter is melted and the candy begins to boil. Take the popcorn out of the oven and carefully pour the caramel over the popcorn, stirring it so that the pieces are evenly coated. Return the popcorn to the oven and bake at 350 degrees F for about 8 minutes, stir 2 or 3 times. It is done when the caramel mixture darkens and bubbles all over the pan. Remove the popcorn from the oven and allow it cool completely at room temperature before breaking it into pieces by hand. It will be crispy when cool. Store caramel popcorn in an airtight container or bag in a cool, dry place.